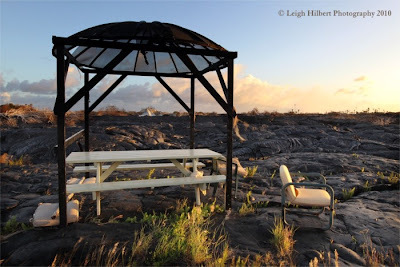 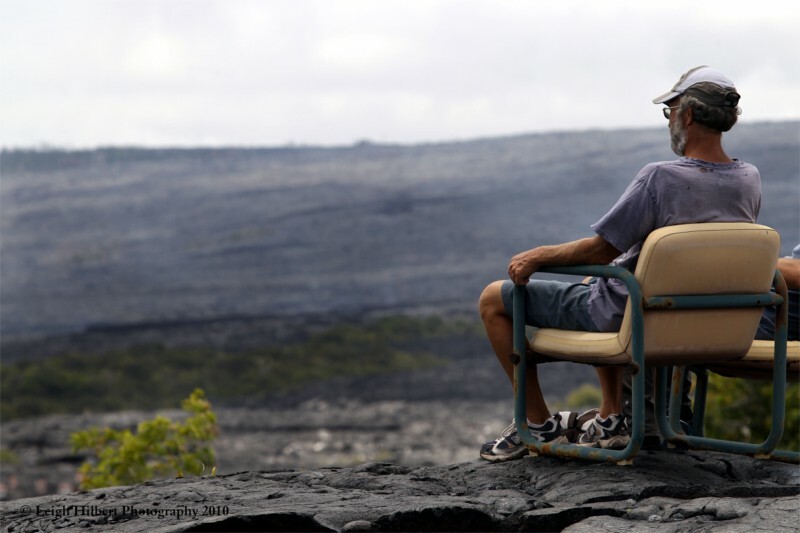 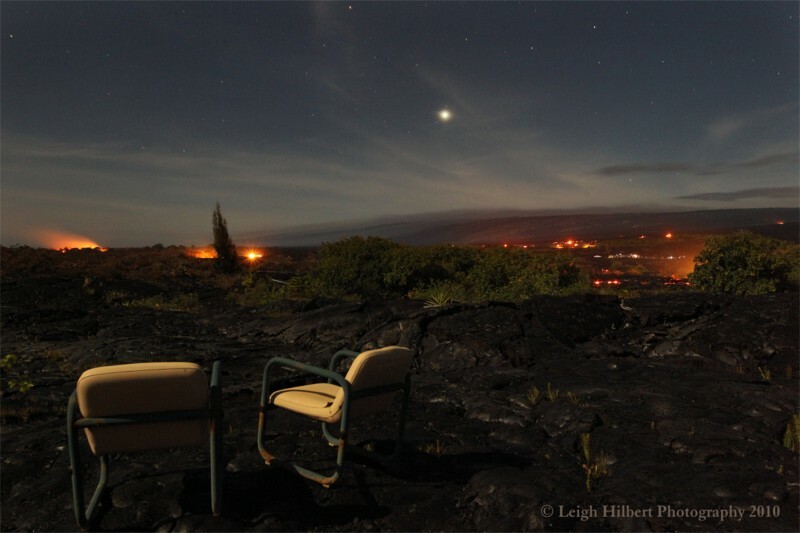 Placed right there on that open rise of lava, the high point of land near his house with the best view, is where Gary Sleik placed his two special chairs when he first began building his home nearby five years ago: one for him an one for any friends who might drop by. 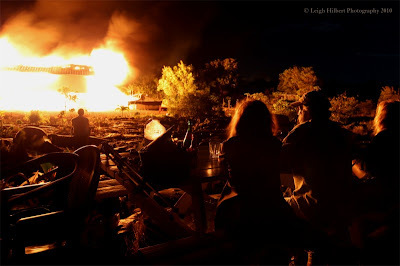 Late one night on July 22nd, just four days after Gary lost his access road to the July flow this year, he and I sat in those chairs under a starry sky and sipped a couple of Eye-of-the-Hawk beers I had hauled across the ninety flow to share with him. 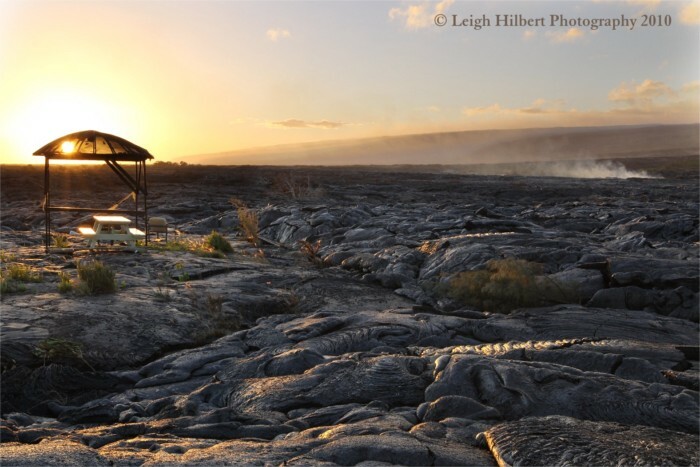 Right there before us was the entire July lava flow unfolding: from mountaintop all the way onto Gary’s property; fields of molten lava were covering hundreds of acres of land and forests. We calmly watched trees flare up like giant torches and then subside. Mango’s heavy with fruit were falling to the massive on-slot of lava – All of this before us; not a single house or street light within this expansive lavascaped evening—just Jupiter, a zillion stars above us and miles of orange-red glowing lava below… Yep those were special chairs. 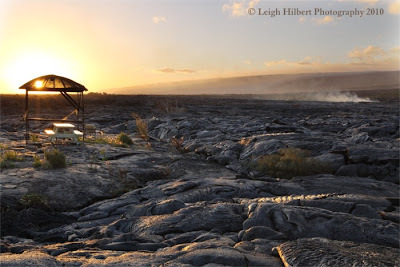 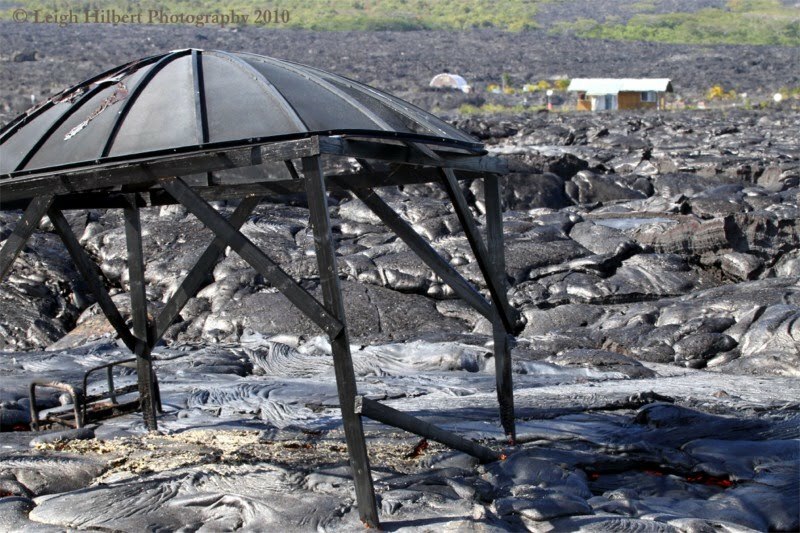 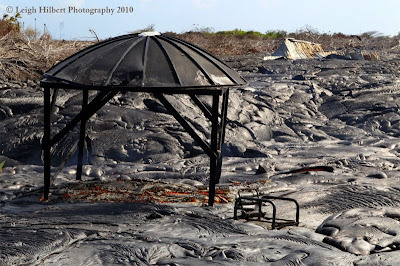 And the little round-roofed structure you see here was added after the lava took out his home. 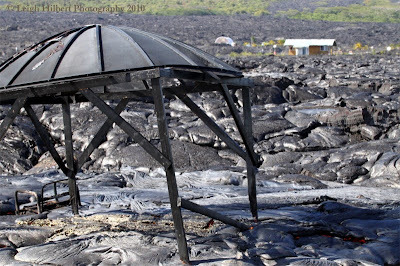 It was made from the top of his original lava-burned gazebo, which had remarkably been lifted up by the lava as it inflated below. 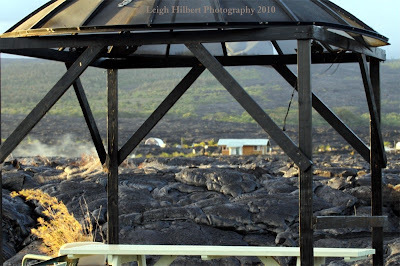 Gary and Dave made the gazebo come back to life on October 3rd, for the special gathering Gary had for a bunch of his friends before he headed off the island for family time on the mainland. 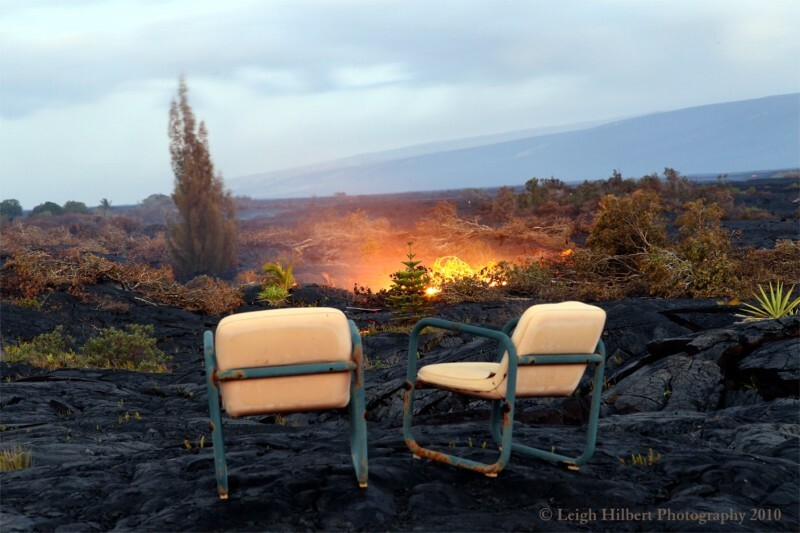 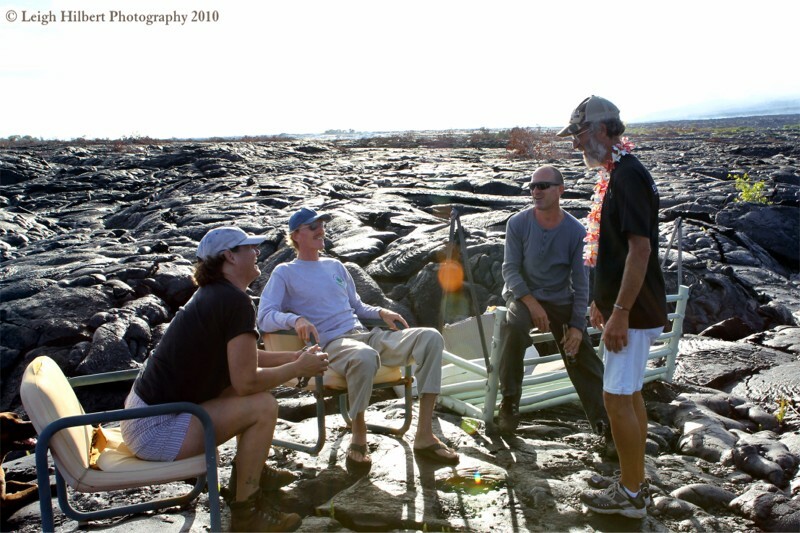 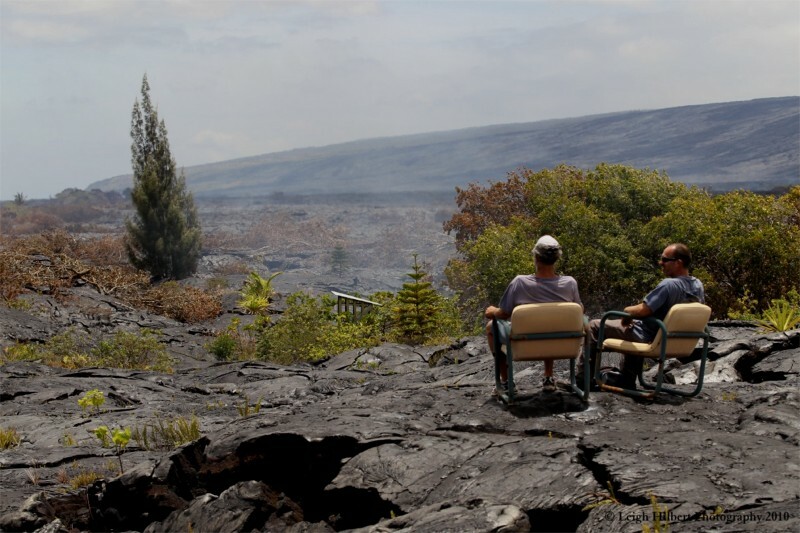 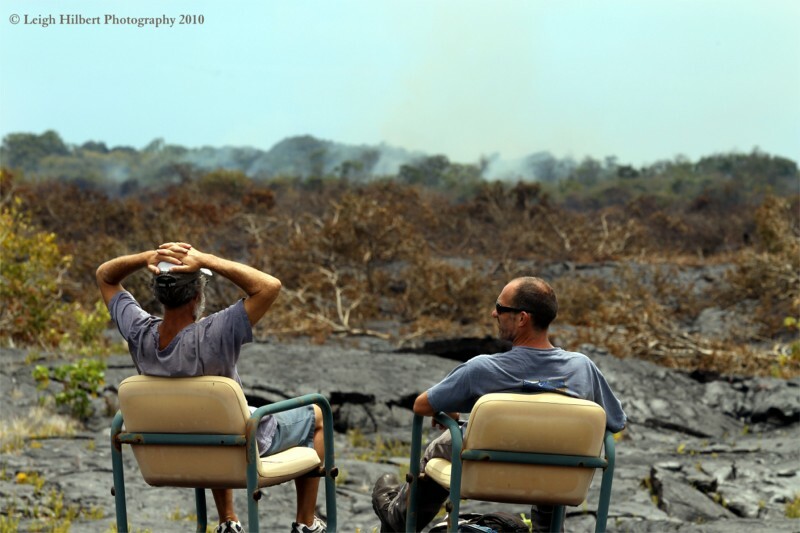 Yep; so here is Steve and Gary talking story in those chairs as lava smolders through the forests and jungle beyond. 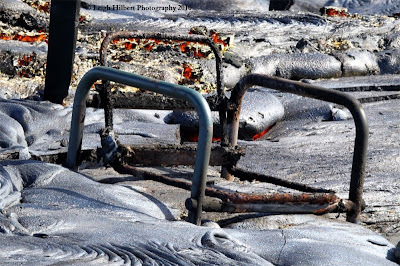 But 24-hours later molten lava broke out of that surround and gushed across Gary’s Last Stand. 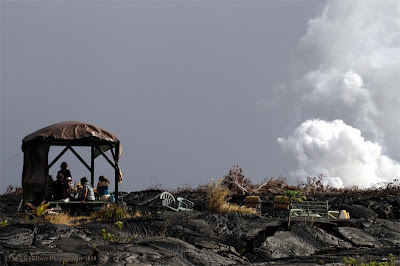 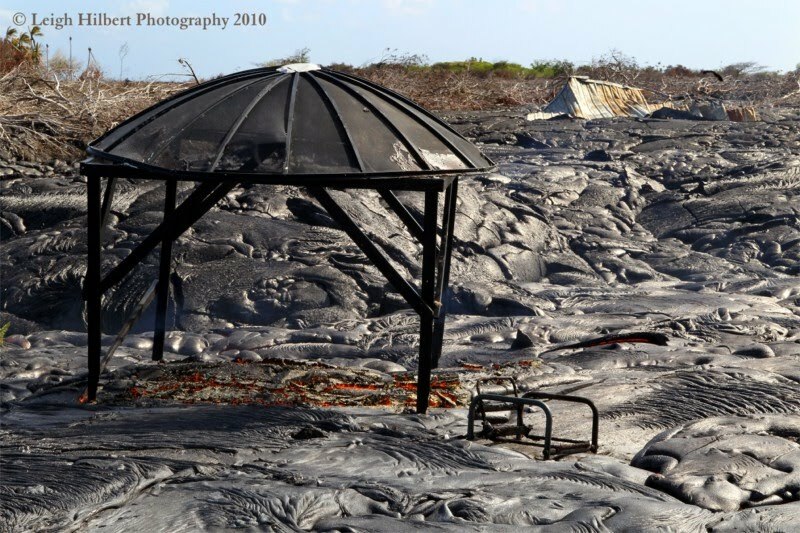 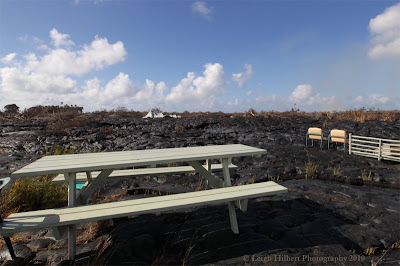 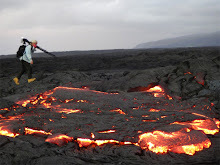 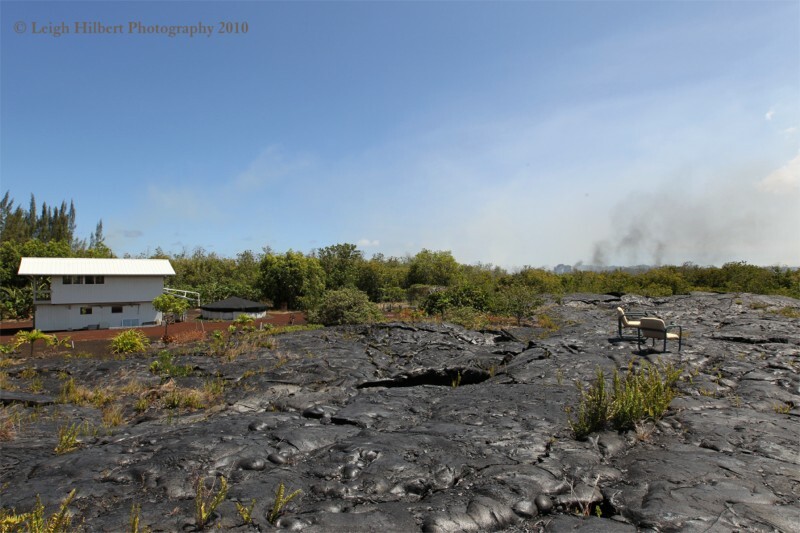 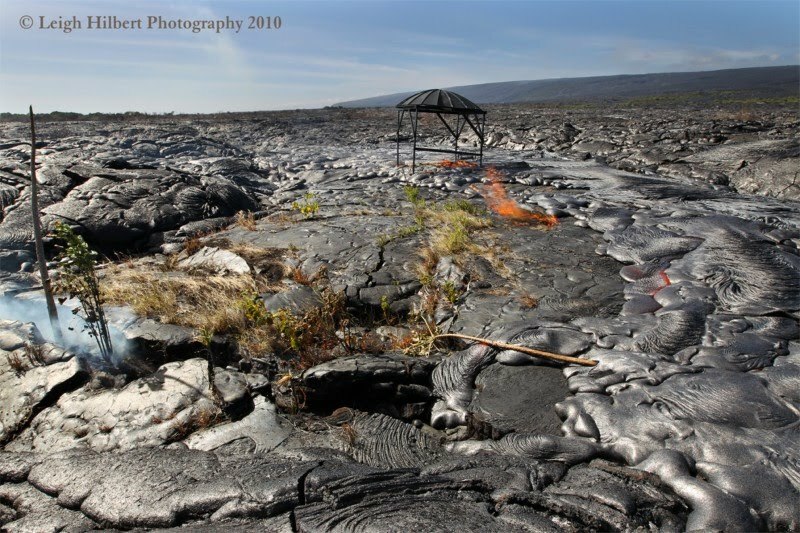 As you can see from the photos below, just hours before Jean lost here home to lava , Gary’s last stand, his last piece of original occupied space on his property, was consumed by a new lava breakout Saturday afternoon, November 27th, 2010. 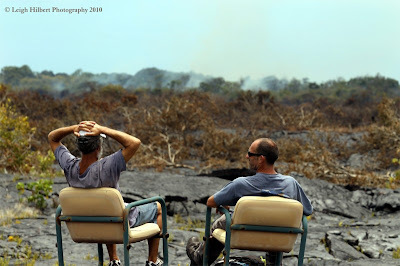 I happened upon the scene as it unfolded, as did Carl and the other Lava Dave. Above, the red under the gazebo is molten lava, below, we can see Jean's house only a few hours before it too was overtaken. We were all saddened to see the chairs go—though at that point only one remained, I think Lava Dave had saved one the day before, leaving the other for Gary … Whose chair is now permanently encased in lava--- but—if no more lava covered it after I took these photos, I could imagine setting another cushion on what remains and still having the best lava view on the island! – Well maybe after we let the rock cool down under it a few more days. 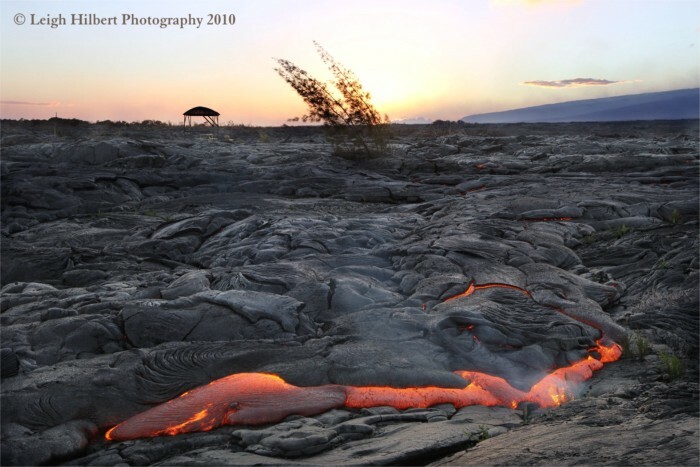 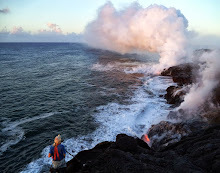 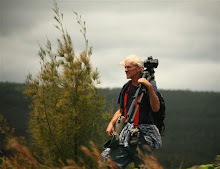 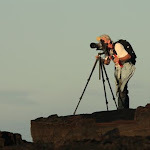 Excellent storyline supported by great photography that gives us insight to the interaction of lava and ocean, people and Pele. Good work, Leigh.